What are the causes of insect bites? Insect bites and stings are most common. The area undergoes swelling and redness. However, sometimes allergic reactions do appear as a result of insect bites. 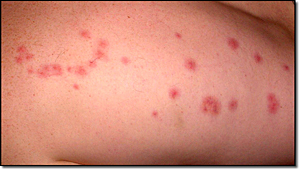 Insect bites can cause red bumps which are itchy and painful as well. If a person is not allergic to stings and insect bites, the local irritation may not be dangerous. Insect bites are caused by horseflies, ants, wasps, lice, spider, fleas, gnats and midges. Most allergic reactions are caused by wasp stings. More than one sting over a specific period of time can make immune system sensitive, thus causes allergic reaction. If a person is unaffected with first time insect bite, it cannot be predicted what will be the affect if the same person undergoes second time insect bite with the same insect. Other parts of a body should be checked if one founds a reddish swelled portion on skin identifying insect bites. Most common insect bites are flea bites, mosquito bites, bug bites, ant bites spider bites, bed bug bites and tick bites.